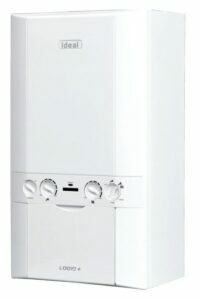 Ideal Logic Plus 30kw Combi Boiler [Review], Or Worcester 30i? Ideal Boilers is a thriving UK boiler manufacturer that now produce 6,000 boilers per week. And the Ideal Logic Plus 30kw combi boiler is one of the most popular in their whole range. Today we’ll discuss the Ideal Logic Plus in detail, comparing it directly to the equivalent Worcester boiler. The Logic Plus range we are about to review is not to be confused with the standard Logic range (known as the Ideal Instinct range in some plumbing merchants). The standard Logic only comes with a 2-year warranty. You definitely want to fork out the extra for the Plus model and grab that extra warranty. The Logic Plus range boasts a no hassle 7-year warranty. Better still, it’s A-rated, ErP compliant and offers over 91% efficiency (which means it’s on par with the equivalent Worcester Bosch boilers). Whether you are looking at an Ideal, Vaillant, Baxi or even Vokera review, every boiler is compared with a Worcester. Branding! The equivalent Worcester used to be a 28i Junior (24i Junior when comparing the Ideal 24kw). But the Junior range was discontinued and has been replaced by the Worcester Bosch Greenstar 25i (Logic Plus 24kw equivalent) and the Worcester Bosch Greenstar 30i (Logic Plus 30kw equivalent). To get Worcester’s full warranty, you’ll need to purchase their own brand controls and system filter. We documented that here. But the flues and flue accessories are also slightly more expensive than Ideal Boiler’s. What this equates to in terms of extra boiler installation cost, own branded controls and filter, flue/flue accessories and extra labour, is approximately £300 extra for a Worcester boiler over an Ideal Boiler. However, Bosch have recently invested in online boiler installation company, BOXT. Naturally, with the backing from Bosch, BOXT are one of the most competitive companies when it comes to installing Worcester boilers. In fact, using a local installer for an new Ideal Logic Plus, will be comparable in price when using Boxt for a Worcester 30i. To compare directly, you can get multiple quotes for a Logic Plus from Boiler Guide’s network of installers here. That’s going to involve a home visit. Backlit display with easy to see pressure gauge. Never miss a boiler service with their newly built-in service indicator. Compatible with a huge range of additional controls. Frost protection technology built in that reduces the probability of a breakdown. The Ideal Logic Plus 30kw combi boiler is suitable for mid-range properties. So, we are talking about 3-4 bedrooms with 1-2 bathrooms and not excessive demand for hot water (i.e. not 2 showers and a tap on at once). Smaller properties are going to be suited to the Ideal Logic Plus 24kw and larger properties will be more suited to the Ideal Logic Plus 35kw. 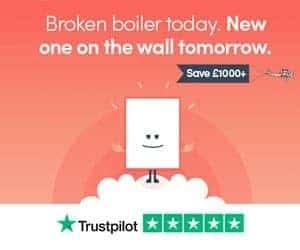 Combination boilers heat hot water on demand, so output is extremely important (speak to your engineer if you are unsure which size is suitable for your property). If your property has more than 2 bathrooms, or excessive demand for hot water, it’s likely you’ll need either the Logic Plus 35kw combi or a system boiler. Most other brands produce a compact range (Worcester has the CDI Compacts for instance) which are designed for the sole purpose of fitting into a standard kitchen cupboard. 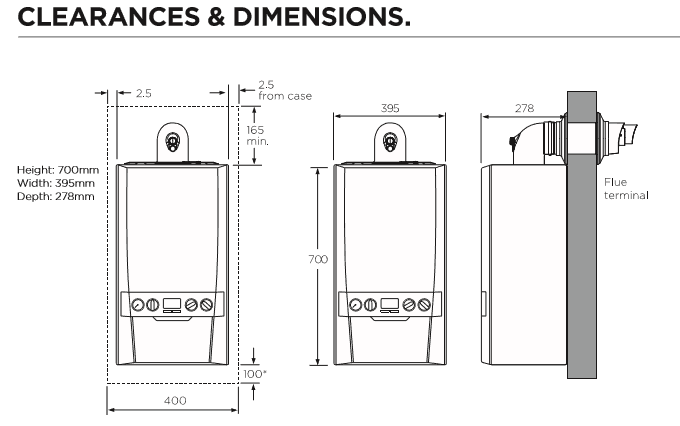 The Logic Plus 30 boilers will fit into a kitchen cupboard as standard. You’ll be getting a 7-year standard warranty with the any Logic Plus boiler. Ideal offer a range of controls for the Logic Plus 30kw combi boiler such as a 24 hour mechanical timer. This is a simple but functional plug-in and play option. This 7 day programmer is simple to use but has some complex features. Users can control both the heating and hot water from a single dashboard. This cool little product will monitor the temperature of the air around your property. As the temperature adjusts, it will adjust the flow temperature of water in your home. So, your heating is perfectly balanced at all time. Tests have shown that an outdoor sensor has managed to improve efficiency by around 2%. Like all boiler brands, vertical and standard flues are available from Ideal. If your flue is likely to be close to a neighbours’ (or your own) window, you can utilise Ideal’s plume management kit which allows the installer to extend the flue. The whole Ideal Logic Plus range offers excellent value for money. Our experience from supplying and installing this range has been extremely positive. It used to be that the Ideal Logic Plus was the favorable option in comparison to the Worcester 30i, mainly due to price. However, since Bosch now own part of BOXT, Worcester boiler installation is available cheaper than ever before. So, we’d be heading straight for the Worcester 30i, with up to 10-years warranty from BOXT. You can get your price here. Still stuck on buying a Ideal Logic Plus? You’ll get a 7-year warranty, with prices comparable to the 30i, and can get quotes from local installers using this form. Thanks for reading our guide to the Ideal Logic Plus. Still got questions? Drop us a line through our contact page and we’ll do our best to help you out.